Yesterday i spent the day visiting my own horse and recuperating from a busy Wednesday that included an afternoon and evening at the Royal Winter Fair. ❤🐎. Are you familiar with it? It's amazing to get to watch top tier competitors in so many different horse sport disciplines all under one roof. Here's a TBT to an acrylic painting I did of my own horse and his buddy a couple of years ago. Where did the time go?! I think this was my last acrylic painting in this style before switching to oils, which lead me to rediscovering acrylics in a new style! But that's a story for another day. It's funny how small the original looks (16"×20", so not particularly small really) now that I've been painting several 30"×40" and larger. Yet it took me what seemd like forever to finish it! What are you up to this fine Friday?! I hope you have a good one! Getting Reacquainted, acrylic on canvas, 16x20. Copyright Renee Forth-Fukumoto. 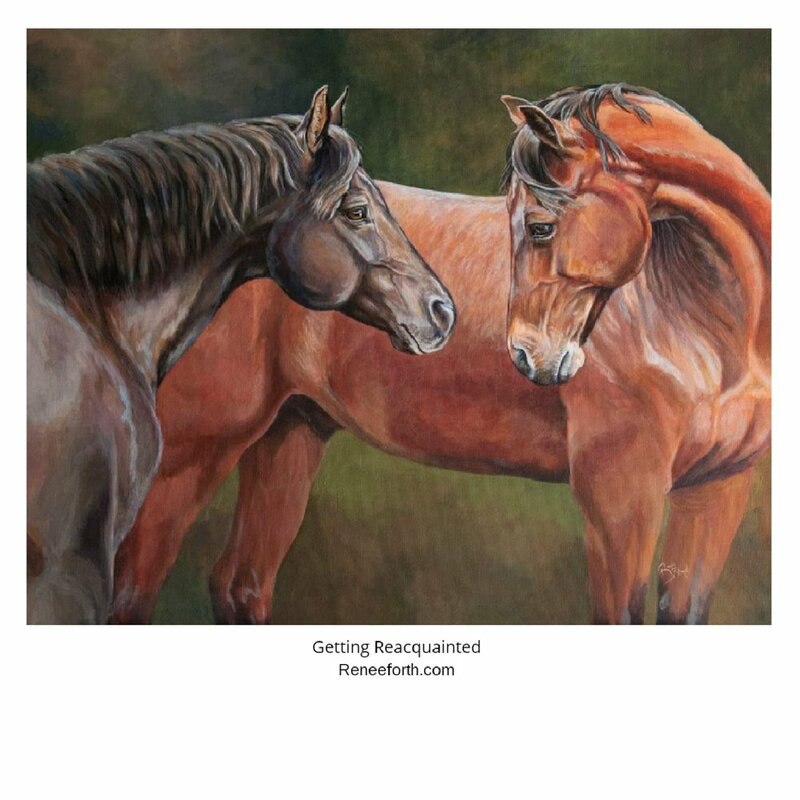 Two horses greeting after a separation period, painted in a realistic style.